The latest Hometrack property prices report is out and it’s more good news for Nottingham home owners! Buyer demand massively outweighs properties on the market – More property needed to sell! Hometrack compares property price growth throughout the whole of the UK and has recently put Nottingham in the top 3 for growth. Nottingham property prices have risen by 0.9% in the last month and by 6.9% over the last 12 months. This firmly places Nottingham in third position across the country, just after Manchester with 7.1% and Birmingham with 8.0%. The other interesting figure to note is Nottingham comes out in first place for total growth over the last 3 months at 4.0%. This tops Glasgow with 3.3% and Leeds and Manchester with 3.2%. The last year has also seen a huge slow down in in London property prices although July has finally seen a small increase at 2.8%. For the full set of information, view the chart below. Rightmove have also released figures for August property prices within the East Midlands as a whole. They state the average price has risen from £207,378 to £208,254. This is an average monthly change across the region of 0.4%. The average property price in August 2016 was only £194,908 for the East Midlands. 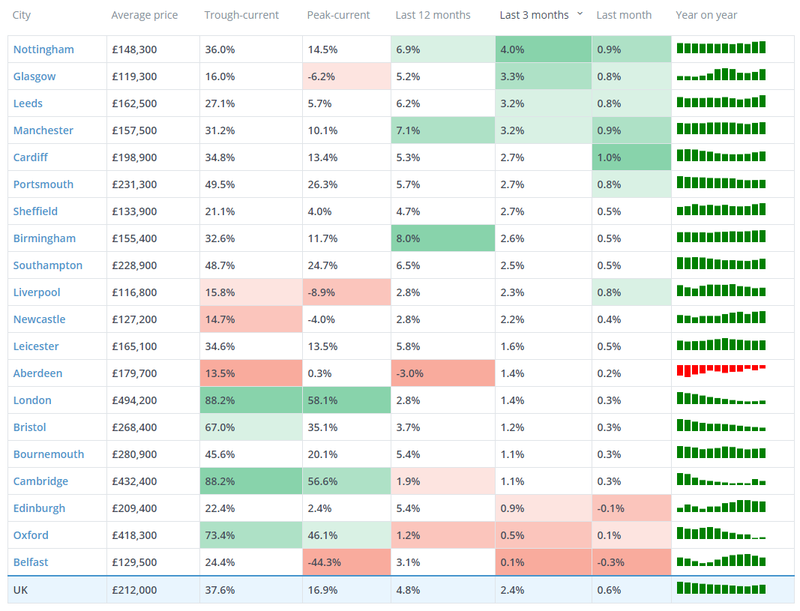 Rightmove also confirm that the Midlands are outperforming the rest of the country. As a whole, most property prices elsewhere are dropping at a rate of 0.9%. They believe the reason for the defiance in Nottingham and the surrounding areas is because there is a huge buyer demand with a limited supply of houses. If you’re looking to sell your property in Nottingham then now would be a great time. Property prices have risen considerably and you could make some money from your sale. If you were to put your property on the market it should sell very quickly since buyers currently outweigh the limited supply of property. Find out how much your property is currently worth by using the below form. Property portal Zoopla has reported mortgage lending is also up. Mortgage lenders have approved a total of 41,587 mortgages last month. This is the highest it has been for 5 months. If you’re looking to gain approval for your own mortgage, whatever your financial circumstances, book an appointment with a broker as soon as you can. You can chat with our mortgage adviser who will compare the whole market for you. Book an appointment below.